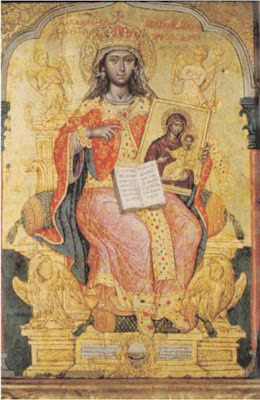 Despite the fact that Emperor Theophilos was an iconoclast, Theodora, his wife, held fast to the veneration of icons which she kept secretely in her chambers in the imperial palace. One day the emperor's jester, a dwarf named Denderis, who had free access of the palace corridors and chambers since he amused all, surprised Theodora while she was engaged in her secret devotions before the icons which her husband had forbidden her. Having observed this as well as her veneration of the icons, he was amazed and, according to his inquisitive nature, asked the empress what it was that absorbed her attention. Composed and calm, Theodora explained in the following way: "These are my beautiful dolls. They are pretty, are they not? I love them dearly." Hearing this reply, the dwarf departed and found the emperor sitting at the dinner table. When the emperor asked him where he was, he responded that he was with Theodora (whom he called "mamma"). "What did mamma say?" asked the emperor curiously. Denderis replied: "She has beautiful dolls under her pillow." Theophilos instantly perceived the true nature of his wife's dolls, and he hurried to the Gynaeceum (women's quarters), burst into her room, and accused Theodora with a harsh tone of harboring icons against his orders in his own home. Innocently Theodora responded, after being told that it was Denderis who made this accusation, in the following manner: "O that foolish and ill-favored little man! When he entered, O Emperor, I was before my mirror and combing my hair. He observed my reflection in the mirror and asked, 'Mamma, what are these?' I told him, 'My dolls.' For I was simply looking at myself in the mirror with my attendants. At that moment thy dwarf thought the faces he saw reflected were religious images, and foolishly went off and expressed it badly to thee." Theophilos then calmed down, or pretended to be convinced. He loved her and could excuse her for anything. A few days later the empress had the dwarf whipped, then reprimanded him and warned him never again to talk about dolls in the Gynaeceum. The lesson was well taken. Theodora had taken these measures primarily to ensure her children were raised Orthodox and not influenced by the emperor, and also to grant favors to the Orthodox who sought her aid. As time went by Theophilos would revert to this subject again with his dwarf after he had been drinking. Theophilos would question Dendrinos about the dolls, but the dwarf would merely gesture in a significant manner, putting one hand over his mouth and the other on the part of the flesh on which he had been flogged, and say hurriedly: "Nay, nay, sire, let us not speak of the dolls." In the capital's high society, there was a general feeling of favor toward the holy icons. The old Empress Euphrosyne, who was spending her last years in a convent, shared Theodora's sentiments, and concealed small icons in her cell as well and would pray before them and venerate them. Whenever Theodora would visit Euphrosyne with her little daughters, Thekla, Anna, Anastasia, Pulcheria and Mary, she would always speak to her grandchildren about the holy images. She would place the icons to their heads then to their mouths so they may kiss them. She too would call her icons "the beautiful dolls". She would say to the girls: "You ought always to love and kiss them." Theophilos, who suspected such things, would question his daughters on their return, however it was always unsuccessful. The oldest knew well to keep this secret, but the youngest, two year old Pulcheria, one day gave the secret away unintentionally. Pulcheria told her father: "Grandmother has a chest full of beautiful dolls. Many times she takes them and presses them to my forehead and those of my sisters. Then we kiss them with respect." Theophilos, vexed at this discovery, flew into a rage. His deepest suspicions were confirmed. From then on he forbade his daughters any further visits to their grandmother, his mother-in-law. God, however, protected Theodora, not allowing Theophilos to take any reprisals against her. Before Theophilos' death, Theodora managed to turn the heart of her husband as he lay suffering on his deathbed. He expired after having venerated willingly with his own lips, Theodora's "beautiful dolls". Two of St. Theodora's icons are kept at the Monastery of Vatopaidi on Mount Athos to this day and are referred to as "Theodora's Dolls". They are displayed annually on the Sunday of Orthodoxy, a triumph which she initiated.